Making Your Own ‘Ginger Bug’. This is a starter culture that will turn fruit juice or sweetened herbal tea into a lightly fermented, naturally bubbly beverage. What you need – fresh ginger, filtered or non-chlorinated water, and whole sugar. You can use rapadura, muscavado or coconut palm sugar. The sugar is food for the good bacteria (not you) that needs to be present in order to make the naturally carbonated soda. The longer you let your soda ferment, the less sugar is present in the final drink – you decide how sweet you want it to be according to how long you let the probiotics work on the sugars. The reason for using filtered or non-chlorinated water (most tap water is chlorinated) is that the chlorine can kill the beneficial bacteria you are trying to encourage. You’ll get better fermentation faster if you use organically grown fresh ginger – and don’t peel it. If conventionally grown ginger is all you can find, then peel it first. It may take up to a week to start bubbling in the cooler weather, and it doesn’t like it too humid either. If you see scary, white mould starting to grow, then toss it out (compost) and start again. Combine the ingredients in a glass jar and stir to dissolve the sugar. Cover the top of the jar with cheesecloth or a dishtowel. Leave it out at room temperature. Stir vigorously each time to dissolve the sugar. After the three days you should start to see some bubbles on the surface of the liquid. Screw on the jar’s lid and transfer the ginger bug to the refrigerator. The cool temperatures of the refrigerator will slow fermentation, but not kill off the beneficial bacteria that are causing it. 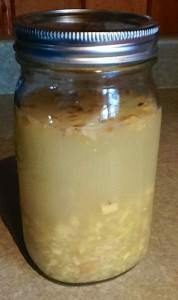 Once you have a ginger bug started, you can keep it going in the refrigerator indefinitely by occasionally feeding it a teaspoon each of grated ginger and sugar. Strain the ginger bug into a large jar. Add the (cold pressed) fruit juice, sweetened tea or bubbly water and stir vigorously. Cover the jar with a clean cloth or towel and leave out at room temperature for 3 days. Stir the mixture vigorously at least twice daily (more frequently would be even better). Do not add any additional ingredients during this time. By the end of the 3 days, you should start to see bubbles on the surface of the liquid. Taste a sip. If it is too sweet for you, leave the mixture out to ferment for another day or two. When you’re happy with the degree of sweetness, transfer the soda to a thick flip-top glass bottle (such as those used to contain bubbly drinks like beer and soda). Secure the cap. Although during the initial fermentation you wanted the liquid exposed to air to allow gases to escape, now you want those gases to build up and create the effervescence you’re after. Leave the freshly bottled soda at room temperature for 24 hours, then transfer it to the refrigerator to chill before serving. If you are using herbal tea rather than fruit juice, it is important to add sugar or raw honey. Remember that the sugar is for the probiotic bacteria, not you! Keep a close eye on your naturally fermented soda once it is bottled and capped. If left out longer than 24 hours, or if the room temperature is very hot or the ginger bug super active, too much pressure could build up from the trapped gasses. That could result in a messy explosion! Transfer the soda to the cool temperatures of the refrigerator as soon as it is sufficiently bubbly.